Observed Danish energy consumption increased by 0.2% to 748 PJ in 2018. The increase can be observed for almost all fuels. Consumption of coal, which saw a decrease of 25.5% from 2016 to 2017, increased by 1.9% in 2018, while consumption of oil and renewables etc. increased by 0.9% and 0.3%, respectively. Conversely, consumption of natural gas fell by 4.9%, partly due to less natural gas consumption by the North Sea platforms in response to lower production of oil and natural gas, and partly due to a larger percentage of mains gas used onshore now consisting of biomethane. Consumption of mains gas increased by 0.5%. The Danish Energy Agency also calculates adjusted gross energy consumption, i.e. energy consumption adjusted for fuel consumption linked to foreign trade in electricity and fluctuations in climate. Adjusted gross energy consumption increased by 0.8% to 778 PJ in 2018 based on an increase in coal, oil and renewables etc. of 5.1%, 1.0% and 1.3%, respectively, while natural gas consumption fell by 4.0%. The increase in coal consumption is most likely due to less wind in 2018, resulting in lower wind power generation. Primary energy production in Denmark fell by 10.5% last year, corresponding to approx. 69 PJ. This decline is primarily the result of a significant decline in production of oil and natural gas of 15.6%, corresponding to 74 PJ, while production of renewables pulls in the opposite direction with an increase of 2.4%, corresponding to 4 PJ. Increased consumption of fossil fuels in 2018 led to a 0.3% increase in observed CO2 emissions from energy consumption compared with 2017. Adjusted for fuel consumption linked to foreign trade in electricity and fluctuations in climate, CO2 emissions rose by 1.3% in 2018. This rise should be seen in light of the fact that 2017 saw a large production of wind energy, and thus low energy-related emissions. 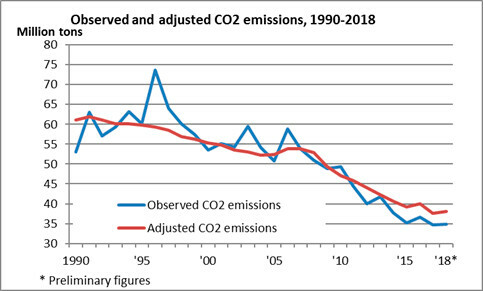 When looking at CO2 emissions over the period from 1990 to 2018, observed emissions have fallen by 34.4%, and adjusted emissions have been reduced by 37.5%. On the basis of the preliminary energy statistics, total observed Danish emissions of greenhouse gases are estimated to have increased by 0.2% in 2018, and emissions adjusted for climate and fuel consumption linked to foreign trade in electricity are estimated to have increased by 1.0%. A final statement of Danish emissions of greenhouse gases will be published later by DCE – Danish Centre for Environment and Energy. The renewable share of observed energy consumption was 32.7% in 2018. This is unchanged compared with 2017. Renewables covered 32.8% of adjusted gross energy consumption in 2018 compared with 32.6% in 2017. The EU calculates the percentage of renewable energy by taking the final energy consumption as the point of departure. It will not be possible to calculate this percentage until the final energy statistics have been published by the Danish Energy Agency in the autumn. 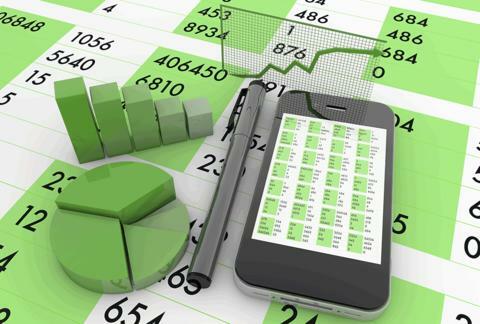 In recent years, the renewable energy share according to the EU calculation method has been around 1-2 percentage points higher than in the national statement based on adjusted gross energy consumption. The degree of self-sufficiency for energy fell in 2018 from 85% to 76%. This means that total Danish production of energy from oil, natural gas and renewables corresponded to 76% of Denmark's adjusted gross energy consumption in 2018. Degree of self-sufficiency is a measure of the ratio between primary energy production and consumption of oil, natural gas, coal, renewables and waste in Denmark. Looking at the ratio between consumption and production of oil and gas alone, Denmark is now a net importer; with a degree of self-sufficiency of 98% in 2018. Energy intensity measured in relation to adjusted gross energy consumption fell by 0.4% in 2018 compared to 2017. A drop in intensity means that gross domestic product rose more than energy consumption. Over the period from 2000 to 2018, energy intensity fell by 24.0%. It is currently not possible to calculate energy intensity for individual sectors. These figures will be included in the final energy statistics to be published by the Danish Energy Agency in the autumn. See the table of facts with the preliminary statements of Danish energy production, energy consumption and CO2 emissions for 2018. Further information: Ture Falbe-Hansen, Head of Media Relations, tel. : +45 25 13 78 46, email tfh@ens.dk or Jane Rusbjerg, Special Advisor, tel. : +45 33 92 68 36, email: jru@ens.dk.